At a press conference in the Westbury Hotel, Dublin on the evening of Monday 24th Nov. 1997,both Paddy Harte and Glen Barr formally announced the establishment and registration of � A JOURNEY OF RECONCILIATION TRUST � of which they both were joint executive chairmen. Among those present were Andrew Coleman T.C., Barry Ellis, and Billy Good of the Bandon Committee. Plans were unveiled to build a Peace Park and construct a Round Tower on Messines Ridge, West Flanders. The aim of the trust was to promote reconciliation between all people from the island of Ireland. An Taoiseach, Mr Bertie Ahern T. D. having endorsed the construction of the memorial, pledged a government contribution of �150,000 to the project. On Tuesday morning 25th Nov. both trustees and patrons travelled to Belgium, which included both Barry Ellis and Billy Good, to meet the Burgomeister of West Flanders, Mr. Jean Liefooghe, at Messines for an inter-denominational ceremony and the � Turning of the Sod � on the site for the memorial .The construction of which was to involve young Catholic and Protestant people from both North and South of the Island of Ireland. Two young men from the Bandon area namely Andrew Burns, Bandon and Donal Coomey, Timoleague were involved with the project. The design of the Park and Round Tower symbolises on site the ideas and features representative of the entire Island of Ireland. Four areas characteristic of the Provinces form part of the Park. The Round Tower was chosen as it pre-dates the Reformation and Political division in Ireland. As such it represents an Island free from modern bias. No one political or religious group can lay claim to it. The symbol of ancient Ireland, Newgrange, is replicated in the design so that the position of the sun will shine down its axis, and enter an opening in the Tower at 11.00 am on 11th Nov. which was the exact hour and date of the Armistice in 1918. 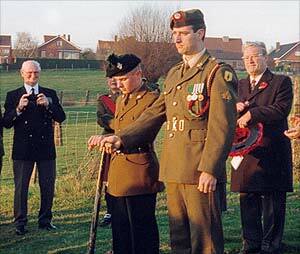 Trooper Paul Kellett from Dublin of the Irish army and Private Christopher Dickenson from Antrim of the Royal Irish Regiment performed the sod turning. During the inter-denominational service those present recited the Peace Pledge. At a subsequent reception the group were welcomed by the Burgomeister on behalf of the town council of Messines, in his welcoming he reminded those present that the following year would be 80 years since the end of the war in which their little town was completely destroyed after 4 years of shelling and fighting. The people of Messines will never forget the young men who came to Flanders and the Somme to fight for their freedom .The Park and Tower would be a symbol of friendship between the Belgian and Irish people and be one more reason to be known as a �Tower of Peace�.